Burgh’s Pizza & Wing Pub offers a beautifully decorated and comfortable room for groups of up to 65 for your special event. 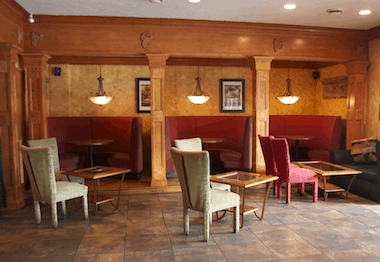 We offer a full service bar, private restrooms, and XM Satellite Radio in a smoke free environment. Let us do the work for you by either customizing a menu or by taking advantage of one of our Party Room Packages. For more information on booking an event at Burgh’s contact us at the restaurant 412.257.8767 or by email at info@burghspizza.com. 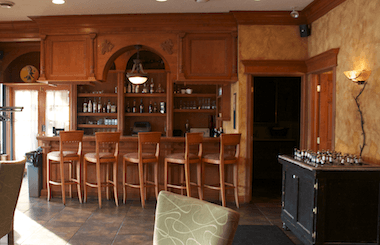 The Burgh’s party / private events room is great for: Baby Showers, Wedding Showers, Rehearsal Dinners, Small Wedding Receptions, Graduations, Birthdays, Funeral Receptions, Business Meetings / Get togethers, Communions, Anniversary, or what ever special occasion you are planning. Click the links below for additional information. Burgh’s Pizza & Wing Pub offers full service catering for all your business or personal events. Whether for breakfast, lunch, dinner, or party events, Burgh’s catering for small or large groups includes food, beverages, desserts, paper products, and more. Whether you have us do it all…or just a portion, we do it right and your guests will be happy!! Delivery of catering services is available through most of the Pittsburgh area, southwest Allegheny County, and portions of Washington, Westmoreland, and Beaver counties. For addition information call 412.257.8767 or email info@burghspizza.com. To preview our catering menu view the document “Party Room Offerings / Catering” under our Party Room tab. Our catering offerings present the wide variety of offerings available. Prices and quantities will be based on number of guest, time of day catering is requested and most importantly to meet and exceed your individual catering needs and those of your guests. If you have a catering offering in mind not presented on this menu feel free to let us know as we always do our best to accommodate your party or event needs.